Android or iOS which one is better? This perennial debate has raged on for the last decade. While each may have its own advantages and pitfalls there hasn’t been a way to enjoy them together, unless you buy two devices, of course. This is about to change with the unveiling of Eye, a smart iPhone case with Android Nougat. 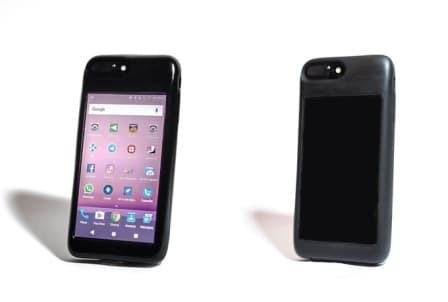 We are not kidding; this iPhone case is real and has been unveiled on Kickstarter for public funding. The Eye is basically a back cover for your iPhone 6, 6s, 7, 7 Plus, 6s Plus and 6 Plus but it has so much more to offer. It hooks up to your iPhone with the help of the Lightning jack and from there on the magic starts. The Eye iPhone case has a 5inch AMOLED display with Full HD resolution. This overcomes the main drawback of the display of the iPhone which has always been IPS LCD display. On smaller iPhones with 4.7inch displays you get an additional display which is larger than the one on the iPhone. The Eye iPhone case runs Android Nougat on a MediaTek Helio P20 (MT6757) chipset that houses an octa-core CPU setup of 2.3 GHz quad-core ARM Cortex-A53 and 1.6 GHz quad-core ARM Cortex-A53 processors. The chipset also houses Mali-T880 MP2 running at 900MHz and 3GB of LPDDR3 RAM. The Eye iPhone case has an internal memory of 16GB and a microSD card slot that can accept cards of up to 256GB. The best part is you can share the data between the iPhone and Eye which means no matter which capacity iPhone you have bought you will never run out of space. The Eye iPhone case has a 2800mAh battery that supports wireless charging, something that the iPhone does not have. The power can be shared with the iPhone just in case it runs out of charge. The Eye iPhone case is available in 3G and 4G, single and dual SIM variants which means you get the option of using another cellular connection with your iPhone which famously does not support dual SIM. There was a lot of hue and cry when Apple decided to drop iPhone jack on latest iPhones but do worry anymore as Eye has you covered with its own headphone jack which works in unison with iPhone. The Eye iPhone case also comes with Bluetooth and IR blaster, things which are missing from the iPhone. The Eye iPhone also takes care of smaller details such as putting the Eye screen a few centimetres lower than its bezels to protect the display when it is kept on a surface. You can use the iPhone rear camera as a selfie shooter with the help of Eye’s display. The Eye will retail in two versions, the one without cellular connectivity will retail at $189 (12,440 INR) and the one with 4G connectivity will retail at $229 (15,075 INR). The Eye iPhone has already crossed its $95,000 pledge goal in just a day on Kickstarter. Early backers will get the Eye iPhone case by August 2017. We however remains slightly sceptical of the project because they haven’t received the blessings from Apple to do so, moreover this project is still in the prototype stage and the final product is yet to be unveiled to the public.